Did you know you help grow demand for beef in more than 80 countries? Find the answers to frequently asked questions so you can become more familiar with the beef checkoff. Consumers love beef, but they have questions. Every farmer has a great story to share. When better quality cows leave the farm and reach the market place, the producer, packer and consumer all benefit. 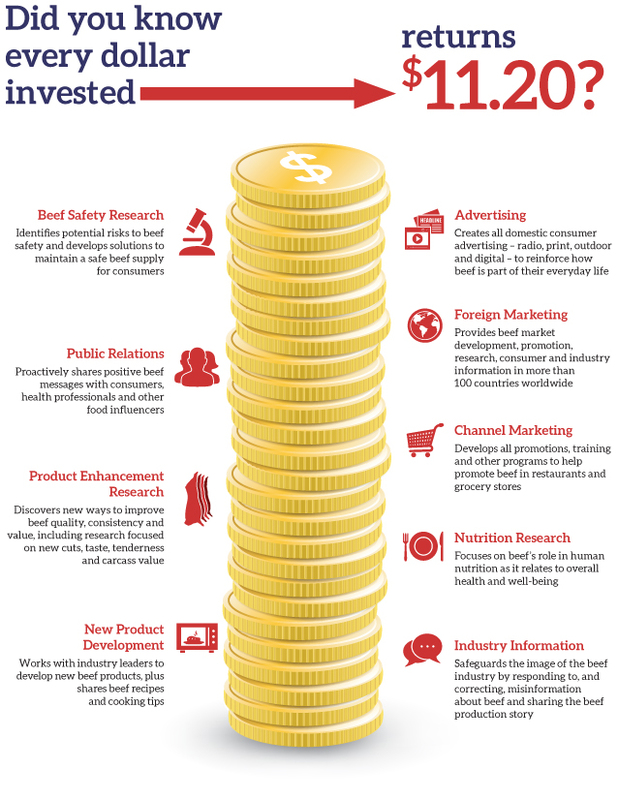 See how much each dollar invested into the checkoff brings back to the beef industry. The Beef Checkoff Program was established as part of the 1985 Farm Bill. The checkoff assesses $1 per head on the sale of live domestic and imported cattle, in addition to a comparable assessment on imported beef and beef products. The checkoff is collected by qualified state beef councils, which retain up to 50 cents on the dollar. The state councils forward the other 50 cents per head to the Cattlemen’s Beef Promotion and Research Board, which oversees the national checkoff program, subject to USDA review. The checkoff program was designed to stimulate others to sell more beef and stimulate consumers to buy more beef. This can be accomplished through initiatives such as consumer advertising, marketing partnerships, public relations, education, research and new-product development.